The spectacular images from the Atmospheric Imaging Assembly on the Solar Dynamics Observatory (SDO/AIA) show a range of highly energetic phenomena in the solar corona like flares and coronal mass ejections (CMEs). These observations not only permit the dynamics to be studied but the different wavelength filters, particularly the six sensitive to coronal temperatures, also allow the heated plasma parameters to be investigated. In this nugget we demonstrate a regularized approach to recovering the underlying temperature distribution of the emitting material from a CME low in the solar corona. The SDO/AIA images show the CME formation which broadly matches the classic CSHKP model of an erupting plasmoid, stretching the magnetic field to produce a current sheet behind it. However in reality this event is considerably more complicated: this CME featured in a earlier nugget. The Differential Emission Measure (or DEM, ξ) describes the amount of material along the line-of-sight within a particular temperature range . The DEM convolved with the temperature response (see UKSP Nugget 4. for more info on the responses) of each wavelength gives the observed signal in each pixel. Unfortunately a direct inversion of the data does not produce a unique DEM solution and additional constraints are needed to achieve a stable solution of this ill-posed inverse problem. Many different solution techniques have been developed (see  for discussion and references) but often with limitations due to the constraints used (e.g. modelling the DEM as isothermal or single Gaussian) or the time it takes to compute a solution. The latter is particularly important as the huge volume of SDO/AIA data (40962 pixels every 12 seconds) has the potential to provide the DEM as a function of position (maps) and time (movies). This is crucial information when trying to studying dynamical heating in the corona. Figure 1:SDO/AIA image of the 03-Nov-2010 CME (left) with the DEMs for the different indicated pixels (right) calculated using all six coronal filters. We use Tikhonov regularization to recover the DEM. This adds a constraint based on the expected “smoothness” of the solution. This method [2,3,4] (intially implemented for the inversion of RHESSI spectra ) is not only quick to compute (our code able to calculate 10,000s DEMs per second) but it makes no assumptions about the model form of the DEM and provides both horizontal (DEM) and vertical (temperature) uncertainties. DEMs for four different pixels in the image of the CME are shown in Figure 1. Figure 2: Movie of the EM maps for 9 different temperature ranges during the 03-Nov-2010 CME. Note that the white pixels are locations where the uncertainty in the data or DEM solution is large (and so ignored) or the value is less than the lowest value of the colour table. 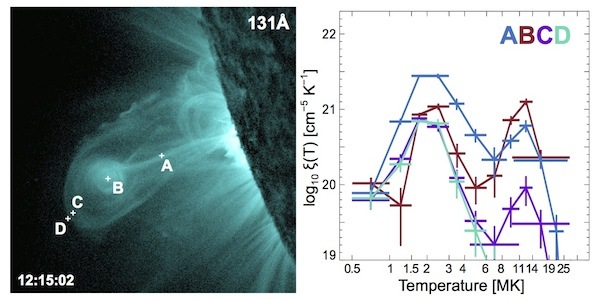 Here we see hot (>8 MK) material in the core (B) of the erupting material, as well as the stem (A) connecting it to the lower solar atmosphere. At the leading edge of the eruption (C) the DEM still shows the hotter component but just slightly ahead of it (D) we only have the single, cooler coronal component. The strength of the regularization of SDO/AIA data is really apparent once we calculate the DEM in every useable pixel (where the signal to noise is large enough and the pixels aren’t saturated) across the six coronal images and then repeat this for the new set of images every 12 seconds. The resulting movie of the eruption is shown in Figure 2, where we show nine temperature ranges. 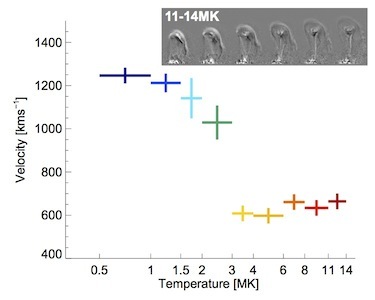 In the 8-11 MK and 11-14 MK temperature ranges we see the plasmoid rising up with the stem-like current-sheet forming behind it. The continued emission from the stem and loops at these temperatures after the eruption shows that there is continued energy release to heat the plasma. Figure 3: EM map in 11-14 MK from 12:15:02UT 03-Nov-2010 with the different components identified. 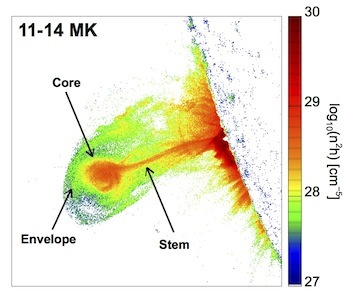 In Figure 3 we show the different components of the eruption clearly defined in the 11-14 MK EM map at 12:15:02UT. Note that here (as in the movie Figure 2) we are plotting the Emission Measure EM and not the DEM, achieved by removing the factor of the temperature bin widths. We do this so that the EM values in each pixel are simply related to the square of the electron density multiplied by the line-of-sight depth. Therefore by estimating the depth (for instance assuming the depth is the same as the width, or that it’s 100Mm deep) then we can calculate not only the densities but also the thermal as well as the kinetic energy (for just the core and envelope as the stem isn’t moving outwards). Doing this for the core and envelope in Figure 3 we find that the thermal energy is consistently slightly larger than the kinetic energy. Figure 4: Velocity of the eruption in each of the different ranges found by tracking the leading front in the EM difference maps, shown in the subfigure for 11-14 MK. We can also look at the time evolution of the eruption as a function of temperature. We calculate the velocity of the leading edge of the eruption in each temperature band by tracking it in a series of EM difference images (shown in the subfigure in Figure 4). For this CME we find that the emission at cooler temperatures (< 2-3 MK) is moving faster than those at higher (> 3-4 MK). Regularized EM maps present a very powerful tool for exploring the dynamics of heating in the corona with SDO/AIA observations, providing the plasma parameters required by those building models of these energetic events. The IDL code to calculate the DEMs is freely available here. An explanation of the code and a more detailed analysis of the CME shown in this nugget are the subject of a paper submitted to A&A , available on arxiv.